You can download our menu from here. The main menu of restaurant Checkpoint Charlie has something for everyone. If you are a fan of European cuisine, you can try our salmon with wasabi rice and marinated zucchini or shrimp with lemon olive oil, pepper steak, duck fillet with caramel apples or tender chicken fillet in a sauce of coconut milk and curry with chili risotto. 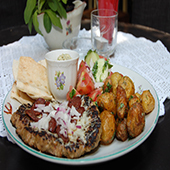 We did not miss the traditional Bulgarian taste, try our homemade cheese pie, served with yoghurt, juicy meatballs on a plate with a salad of roasted peppers and pink tomatoes with red onion, spicy kebapchentsa and the forgotten polenta with cheese and butter ..